Australian Wool Innovation has stated it will progress with its Wool Exchange Portal (WEP) beyond the scoping stage and is now moving to the “discovery stage” where the portal is built. Expected industry benefits are $38 million over the first 15 years. In this article Mecardo puts this expected benefit into perspective. In March 2016 Mecardo looked at supply chain costs for wool, grains and meat. The transport/marketing and logistics cost were 5.5-7% of the commodity value for meat (beef and lamb) and wool. The cost of selling wool was on par with the red meats. 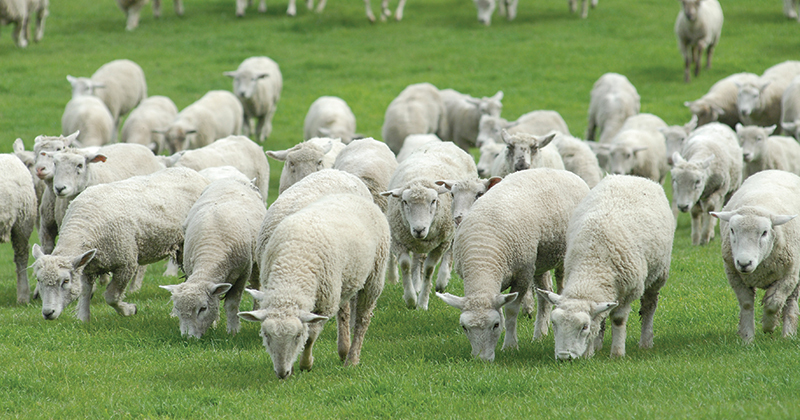 What are the detailed costs incurred when selling wool? Figures 1 and 2 are drawn from the 2009-10 Sheeps Back to Mill analysis. Figure 1 shows the direct costs to growers for getting wool off the sheep back (shearing) to sale. The total cost (as of 2009-10) was $390 per farm bale with 72% of the cost coming from shearing. The balance of the costs is split between transport to store and various selling functions plus industry levies. 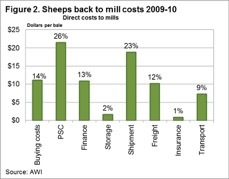 Costs incurred by growers after the wool has been delivered to store (excluding shearing and delivery to store costs) were $72 per farm bale in 2009-10. 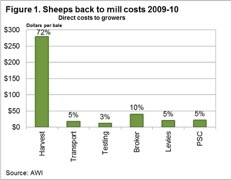 Figure 2 shows a breakup of the costs associated with purchasing wool (direct costs to mill) in Australia which totalled $75 per farm bale in 2009-10. In total it cost $175 per farm bale to sell wool in 2009-10, through a system with no counterparty risk. Figure 3 combines all the costs after stripping out the shearing and delivery to store cost. This is a breakup of the $175 per bale cost of selling wool in 2009-10. The combination of broker and post-sale charges (PSCG and PSCM) accounts for about half of the cost, which was about $82 per farm bale in 2009-10. In Australia in 2017, around 1.5 to 1.6 million farm bales will be sold annually through the auction system. In May the average gross value per bale was $1670. For the past three years the average gross value per bale sold has been $1411. Now, back to the expected industry benefits from the WEP of $38 million over 15 years. This equates to $2.53 million industry benefits per year, which when expressed as a dollar per farm bale number is $1.63 per bale (assuming 1.55 million bales sold annually). 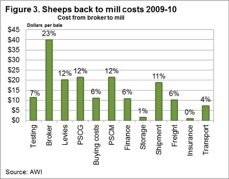 This is about 1% of the selling costs (from wool store to mill) identified in 2009-10. In terms of wool value it represents 0.1% of the average bale value of wool sold during the past three years. Either way the projected industry benefit is small beer. AWI commits to building a Web Exchange Portal (WEP). Projected industry benefits are $38 million over 15 year. This works back to $1.63 per farm bale per year. The projected benefits account for 1% of post farm selling costs. While the wool selling system carries some risk if a wool broker goes broke, it carries no counterparty risk as wool is only shipped from store after payment has been received. Not many commodity selling systems can boast of such a robust system. The proposed industry benefits from the WEP account for 1% of post farm selling costs or 0.1% of the value of farm bales sold during the past three years. These projected benefits are very small. Are there no bigger problems with greater pay offs for the wool industry to tackle?